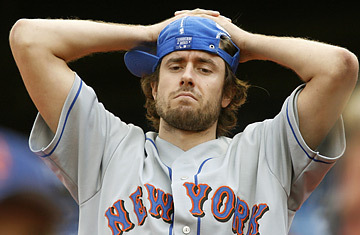 A distraught New York Mets fan lingers in the stands after the Mets' 8-1 loss to the Florida Marlins at Shea Stadium in New York. Children in tears. Women with hands over their faces. Grown men holding their hair, mouths agape, as if they had just witnessed a horrible implosion. In many ways, of course, they had. On Sept. 12, with 17 games left in the regular season, the New York Mets led the Philadelphia Phillies by seven games in the National League's Eastern Division. No team in baseball history had ever blown that big a lead, that late in the season. Until now. After the Florida Marlins whipped the listless Mets 8-1 on Sunday, and the Phillies finished off the Washington Nationals 6-1, the team's faithful were on the verge of a collective meltdown. So how do they get over it? How can sports fans, whose teams so often tease them with outsize expectations, deal with such unexpected failures? How should I, a lifelong Mets lover who has lived through so much disappointment from this franchise, take the greatest heartbreak of them all? "Coping strategies work very well when there's some ambiguity," says Daniel Wann, a psychology professor at Murray State (Ky.) University and author of Sport Fans: The Psychology and Social Impact of Spectators. "But up seven games with 17 to go  there's not a lot of ambiguity to this." Ouch. Notes Edward Hirt, an Indiana University psychologist who has studied fan behavior: "It's not one of those things where I can say, 'Do this for 30 minutes, and you'll get over it.' People are going to ruminate." Fine, we know it's going to be hard. But still, there must be some mental exercises that can help ease the pain. The first step is to accept how much it hurts, regardless of those dismissive observers you might know who tell you to have some perspective, that it's just the end of the season, not the end of the world. Sure, the fate of your sports team is less pressing than, say, your marriage or mortgage, and it may seem ridiculous to tie your self-esteem to the actions of multimillionaire athletes who don't know you one bit, but you have to allow yourself to mourn a little. "It's natural to be upset," says Dr. Richard Lustberg, a clinical psychologist from Long Island and creator of the Psychology of Sports website. "Baseball is being taken away from you. It's difficult to handle, especially when watching Mets games have become part of your routine. There's some reality to it. It's like you've suddenly had an aneurysm." Lustberg is a Mets fan, and hearing a shrink struggle to cope is very comforting. "I was driving to work today, and I go, 'Aw, s__, the Mets aren't on tonight," says Lustberg. "What am I going to do? I'm annoyed with the team. There has to be a period of withdrawal, and I know it's going to take a little while." Not surprisingly, one strategy Lustberg and other psychologists recommend is shifting your focus to other sports. College and pro football are in full swing, and basketball will soon be tipping off. Don't spend too much time watching the baseball playoffs, especially the Phillies, whose presence in the post-season will make fans even more bitter. "Today, a bunch of Mets fans should turn their attention to the [New York] Giants," says Christian End, a psychology professor at Xavier University in Cincinnati. "Pick up the paper, and read about the 12 sacks they had against the [Philadelphia] Eagles on Sunday. Unpack the Giants memorabilia from your drawers." Problem is, I like the New York Jets, who are 1-3 and lost to Buffalo on Sunday. Luckily, End also recommends a trick any fan can use, something psychologists call "social creativity." Basically, make yourself feel better by comparing your team to one which, historically, has been much worse off than yours. Take the Phillies. They've been around for 125 years, and won just one World Series, in 1980. The Mets have won a couple since their birth in 1962. Philadelphia lost its 10,000th game this season, the most in professional sports. The franchise is also famous for a choke of its own, the 1964 team that lost the pennant after leading by 6 1/2 games with 12 left to play. They may have topped us this time, but thank God the Phillies aren't my team. That feels a little better. Wann, the Murray State psychologist, also recommends what he calls "retroactive pessimism." "A guy doesn't get a job, and he tells himself, 'Gosh, the field was so competitive,'" he explains. "'There was nothing I could do to control it.' It has nothing to do with the fact that he's lazy and unqualified." You can do the same thing here. The Phillies are a team of destiny. Sure, the Mets didn't play well down the stretch, sure they made 21 errors over the last 17 games. But gosh, give those Phils credit: They went 13-4 in those final games. Really, who could stop them? (Answer: a team that did any better than 5-12 in those same 17 games). Hey, I'll try anything. And who knows, in some ways, this whole horrible experience may provide unexpected benefits for Mets fans. "The beauty of being a fan is that it's something personal that you can share," says Hirt, the Indiana professor. "There are other fans to commiserate with, to talk to about how much this stinks. 'We're loyal, and we have each other.' That's a very positive thing.'" Group hug, everyone. Right about now, we could sure use it.